The Planet Wheel is a compact and convenient tool to help you track the planets of the Solar System through the sky. The main 'wheel' display shows you the positions of the Sun, Moon and all the major planets at a glance, and the app also includes a starmap to show you how to find the planets against the background of stars. The Planet Wheel app is an interactive version of the popular service on the Electronic Sky Website, with a host of extra features to help you find your way around the Solar System. The main Planet Wheel display gives you a simple way of checking which planets are visible, and the best time of night to look for them. The Starmap feature maps the planets against the background of stars, and also shows you which constellations are visible at any time of year. Both the Planet Weel and Starmap views include animated displays: hold down the animation buttons to watch the Sun, Moon and planets travel across the sky, forwards or backwards in time. See the positions of the planets for any date and time from 1900 to 2100. The Planet Wheel provides full access to online resources on the Electronic Sky Website. 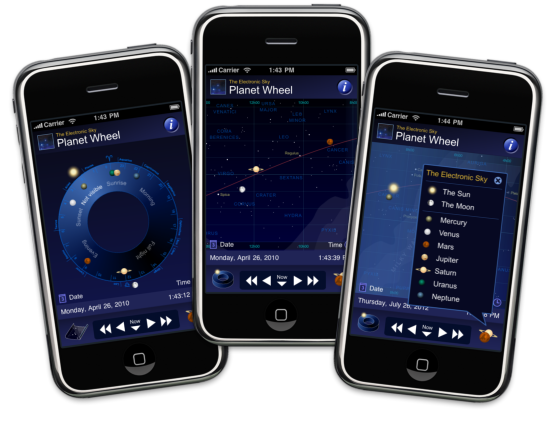 The Planet Wheel app is available now from the iTunes App Store.